What is the name of your recording label? You are only 4 steps away from registering yourself (and your company) as a major label! Upon approval, you will receive a major label access code. This will allow you to distribute your music to over 1,000 digital stores and apps all over the world! Stores and apps include major brands such as Apple Music, iTunes, Amazon, Google Play, YouTube Music (YouTube Red), Spotify, Tidal, Anghami, Saavn, KKBox, iHeartRadio, Shazam, eMusic, Napster, and more! Sign Yourself: You can sign yourself as an artist on your own label and make more money off of your music through royalties (from purchased downloads) and streaming. Sign Other Artists: You can start signing artists to your label and make money off of their music as well. Music Distribution: We will distribute your music to over 1,000 digital stores and apps all over the world! This includes major brands like Apple iTunes, Google Play, Amazon, 7digital, eMusic, Saavn, and many more! Music Promotion: Every release you submit for distribution will get promoted for free to our network of over 150,000 registered and vetted music industry vets, club DJs, radio DJs, record label execs, and music loving fans all over the world. Music Publishing: We will publish your music on sites, stores, and apps that will generate revenue from streaming. 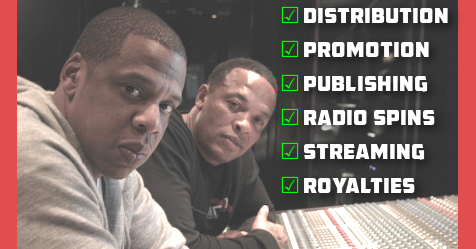 This includes major brands such as YouTube Red, Spotify, Apple Music, Tidal, iHeartRadio, and many more. Royalties: We will collect royalties (on your behalf) from any and all music stores and apps that allow (paid) downloads and streaming. These funds can be paid to you via PayPal, Google Pay, PopMoney, or Cash App (Square).